Location, location, location. The adage doesn’t just apply to real estate; it applies to the world of craft beer. Some of greatest beers being produced might simply not be available anywhere near you. So what’s a hophead to do when he wants to try some Heady Topper or Pliny the Elder but he lives in Texas? So you clicked through to one of the sites above and it looked like it was written in another language. When it comes to trading beer, shorthand is king. The two basic terms you need to know are: ISO (In Search Of) and FT (For Trade). So when you post your first trade, type ISO and then the beer(s) you’re looking for, followed by FT and then the beer(s) you’re looking to trade. Outside of that, the rest of the abbreviations you’ll pick up over time. Breweries get abbreviated often (FW – Firestone Walker, RR – Russian River, CCB – Cigar City Brewing), beers get abbreviated (BCBS – Bourbon Country Brand Stout), and so do other terms (BA – Barrel-Aged). It takes some getting used to, but you’ll pick it up. How Much Is Your Beer Worth? 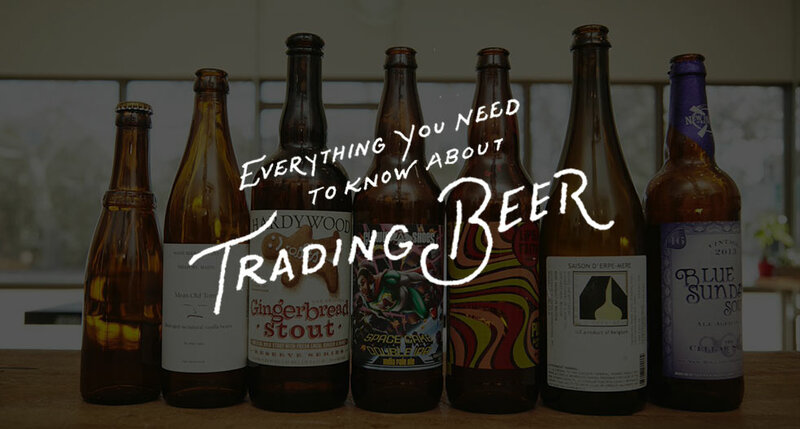 Now that you know where to go and how to decipher what people are saying, you’ll want to set up a trade, but how much is that beer you have worth? You’ll need to do a little legwork. Supply and demand is the name of the game. But fear not, you don’t always need the latest release from Hill Farmstead or this year’s Bourbon County Vanilla Rye to make a trade happen (although it doesn’t hurt). First, determine what’s distributed in your area and not everywhere else. To do this we recommend Seek-a-Brew. Consider the best and rarest beers from these breweries your ‘locals.’ These beers will hold some value since people far from the distribution area would have a harder time getting them. The highest rated and rarest of these locals will probably fetch you some nice beers in return. Second, get familiar with special bottle releases. When something new and good pops up, it usually dominates the trade forums for a while. Knowing ahead of time to get your hands on it if it’s in your area, or to get a trade together to attempt to snag a bottle yourself, will put you ahead of the game. For this, we recommend signing up for Beer Served Rare, which will send you updates via email. When beers are equally rare and equally desired by both parties, many traders will go dollar-for-dollar with you. But Wait, Is This Legal? Yeah, about that. First off, don’t ship USPS. Even though it’s unlikely, that’s the quickest way to get into some trouble. After that, yeah, you’re breaking some rules. Even with UPS or FedEx, you’re not supposed to be shipping alcohol without a license, and certain states are completely off-limits even with one. It has to do with taxes and possibly shipping to a minor. That said, you probably won’t run into any issues if you’re smart, but you didn’t hear that from us. First, pack your beer well. A quick way to spot someone shipping beer would be a soaked cardboard box that smells of hops and malt. Go bubble wrap, ziploc bags, filler material, and maybe even wine bottle inserts if you want. Pack it well! To counteract the sound of liquid moving around, you can also include a sort of homemade noisemaker in the package using rice or beans and an empty little box. If anyone asks, you’re shipping olive oil and vinegar as a gift. This is the part where you decide if it’s worth it. We won’t say you can’t get in trouble, but we will say it’s unlikely. On your first trade, it’s common courtesy to offer to ship first. Sites usually have a section for users who were reported as bad traders (avoid them, obviously), but since you don’t have a track record, shipping first is the norm when you’re a newbie. It’s not necessary, but many people toss in an extra beer or two. It’s a nice little aspect of the craft beer trading community, and it can make you a few friends and future trading partners in the process. Leave feedback on the trade. Did you trade with someone who packed your brews perfectly and sent them out quickly? Let others know. Building up your own good rep will help, as well. Use CellarHQ. Trust us, as your collection grows, you’ll need a way to stay organized. CellarHQ will help you keep tabs on what you have to trade and what you have to drink.